When you’re having trouble making ends meet or you feel like you are just barely keeping your head above water how in the world can you even begin to think of saving for a trip and taking a vacation? I used to think like that. I felt we were barely surviving and the thought of taking 4 kids on any trip and saving for vacation just seemed like a luxury we couldn’t afford. But, I cherish the memories of the few trips we were able to take when the kids lived at home. We got through the times when money was tough and I barely remember each of those circumstance, but, I very vividly remember the trips we were able to take. Don’t rob your family or yourself of those memories. With a vacation savings plan or travel savings account and some tightening of the belt you can make it happen. You may or may not make it all the way to Disney but, there are plenty of great family trips that don’t include an over priced theme park :). You can start off by taking control of your finances with budgeting tools. 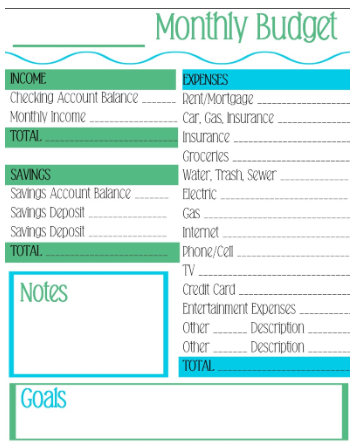 You can find several different easy budgeting ideas here: 6 Ways To Start A Successful Budget Plan You can also download this free printable Monthly Budget Worksheet to help you get started. Exactly what sort of planning you ask? What is the best way to save money for a vacation? Well, let’s dig in and find the best way for you to make that vacation happen! Gas is not the cheapest thing these days and it’s definitely an area where we can cut costs. Find a car pool for the kids for school or for you for work, or look into a ride share in your area. Cutting a few days of gas costs out of your budget a week is a great way to save. Just add that to the vacation savings plan or travel savings account each month and watch that fund grow! You don’t have to go completely off cable, you can just fine tune your package. Maybe you only watch certain shows on certain premium channels, so in the months when it isn’t airing cut it off and get it back when it is. You can negotiate pretty easily with them, too. Especially when you call in to cut some part of your bill they can often find you a great deal to make it less than you were paying. BUT, be SURE to mark the end date of your new deal on your calendar and call back in and renegotiate before they hit you with full price and you get caught in a trap! There are also many ways to lower your cell costs. Make sure your using all that you’re paying for each month or cut it out of the bill. It’s important to check every few months and make sure you are getting the best deal possible. Just call in and tell them you’d like to find a way to lower your bill. They have specialists that can search and find you any specials they have running that you are eligible for or they can tell if you never get near your data limit and you can drop down to the next package. This applies also to cable and cell. Just like I said above make sure to call in every few months and make sure you’re getting the best deal. Here in Texas the electric companies are constantly trying to out do each other and often offer great deals. If you do take them up on a package know that it is for a limited time and you need to mark your calendar and renegotiate before that limited time is up. We missed it once last year and our electric bill was sky high. We called in and they said we were paying full price because our “deal” was over…. It was more than tripled. They helped us find a new deal and you can believe we’ll never let THAT happen again! Check out Energy Ogre – they find the best price for your situation and continue to improve it all the time. A new reporter here showed his bill was just $56 after signing up with them. You don’t have to be an extreme couponer to save money in this department. It’s actually pretty easy. You can do it with or without coupons, too. The main thing, if you prefer not to use coupons, is to know when things are on sale and buy them then. Also know if your store price matches and find the best deal in the area on what you want to purchase and price match it at that one store and not have to worry about running around town to get all of the deals. When you DO buy on sale, buy enough to last you until that item goes on sale again. Prices on the things you buy fluctuate between 6-12 weeks normally. Somewhere in that time there will be a “rock bottom” price – that’s when you buy, with or without coupons and buy enough to last until that happens again. You don’t want to get caught paying full price because you ran out the week before it hit rock bottom. Ok, so that’s where the mind naturally goes, right? Lose all the things we like – the perks we give ourselves to be comfortable. Can we do without them? Mostly. Do we really want to – even for the sake of saving for a vacation or get away… not really, if we’re honest. So, let’s take a look at some ways to MAKE extra cash and save THAT! Now, of course, we can do both the above and the following and supercharge our savings and get there quicker! There are a NUMBER of grocery apps that will PAY you to buy your groceries! They are super simple and with a little planning you can find that rock bottom price we talked about AND get cash back afterwards often making the item free or more than free! Here are my favorite money making grocery apps <— Click here to learn more about each one – they are all simple and free! Yaarlo (please use referral code: DIANHARR862 – I get a referral fee) That’s another way to make money refer it to your friends with YOUR referral code and get paid that way, too! There are plenty of places to list your unwanted items. You can list them on eBay and ship them to your buyers. But, there are also local places you can work through and meet up with people to sell. Facebook has a marketplace that’s free. OfferUp and 5Mile and other apps offer these services as well. You can clean out the garage and make some cash without having to haggle at your own garage sale. Speaking of which – Garage Sale – have a garage sale and clean it all out in a day or maybe a weekend! Now there are delivery places and car services you can drive for in your spare time and make some money. You drive on your own time and make your own schedule! So, you are the one who determines how much you make and how fast. If you’re a stay at home parent you can babysit. I did that for years and made a nice bit of money and my kids had playmates, I also drove kids home from school and babysat after school. Think outside the box! If you’re a crafty soul then you can make things and sell them on Etsy or eBay. I have seen people make an entire business out of hairbows or hair ties! Put on your creative hat – the sky’s the limit here. My daughter and her husband make a very nice full time living from buying things and reselling them. She has learned to refurbish almost anything. They watch on the apps and online for things being sold cheap or for free, then they pick them up, fix them up, and sell them for a nice price. They also charge for delivery if their customer wants it delivered. I had a friend who loved to bake cakes. She went to Putt Putt and asked if she could do their bakes for their birthday parties. They hired her, she worked from home and made and delivered the cakes. In the past I have done hair on the side (I am licensed), answered phones, freelanced to companies to optimize their office pc’s, babysat, sold in a craft mall, was a PowerSeller on eBay, started my own home repair business – I found the work and hired the professional – I was the middle man. I am sure you can think of something you like to do or are qualified to do and offer your services. There are ways to save what you use everyday, too. We all kind of ignore change, it falls in the bottom of the purse, ends up in the cup holders or floor of the car, or often just lost. This is a place where every little bit helps and it DOES add up. Make yourself a change jar somewhere prominent you will remember and let everyone contribute their change. It will help the kids feel like they are contributing for that vacation, too! This is something I have done for years. (It also helps cover you if you make a mistake in your calculations) When you write in your ledger that you spent $5.57 – instead round it up to $6. At the end of the month figure out the overage and move it over to your vacation fund. That REALLY adds up, as well! I hope this list of ideas helps you figure out How To Save Money For A Vacation. Sometimes we get stuck in our thinking and we can’t see beyond our situation. 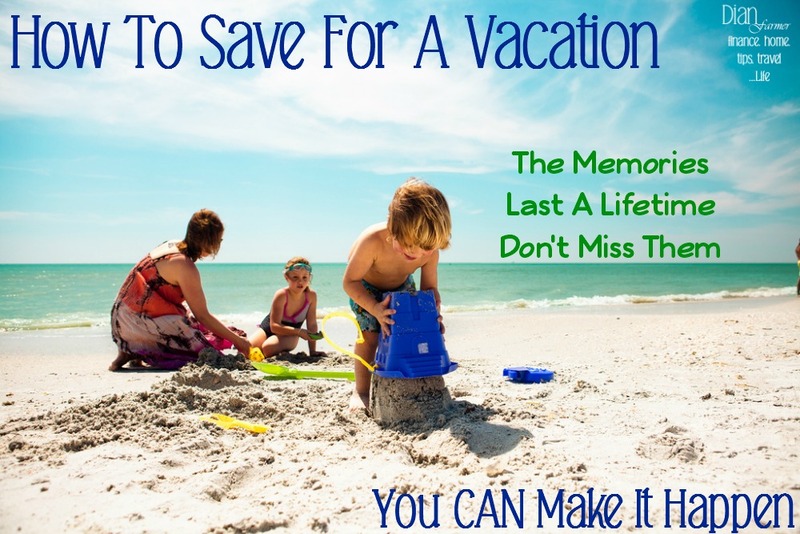 There’s plenty of ways to find, make, and save money for a family trip – again it doesn’t have to be elaborate, just a time when you all get away from everyday life and make those memories! If you have any more ideas, please share them in the comments below!